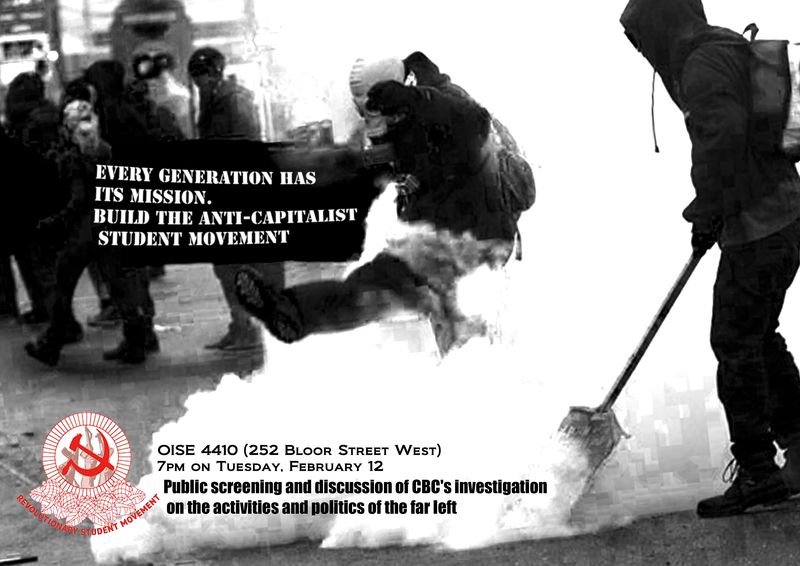 Join the RSM for a public documentary screening on the activities of the far-left in the Quebec student struggle and open discussion to follow. Tuesday, Feb. 12th at 7 pm, OISE rm. 4410. The Quebec Student Strike of last year no doubt inspired and radicalized a generation of young people. As capitalists continue ravaging this earth, ruthlessly exploiting and attacking workers and poor people across the globe in its relentless drive to squeeze more & more profit for their greedy selves, this generation of youth–and in particular, working class youth–is left facing a bleak, harsh, and grim future. Students in Quebec mounted a fierce resistance against the capitalist agenda, first fighting against tuition fee hikes and then expanding the fight into a mass social struggle against the Liberal government. The utter defiance against the Quebec government’s repression and attempt to implement a special (emergency) law was a blow to bourgeois legality! The Revolutionary Student Movement invite those who are fed up with the current state of student politics and who want to organize on a firmly anti-capitalist foundation to a free public documentary screening (with English subtitles) on the activities of far-left during the strike. We welcome discussion on the pitfalls of peaceful protests vs. the militant and sometimes violent actions that occurred over the course of the strike; on spontaneity and organization in the anti-capitalist struggle; on popular democracy in our schools and on our campuses. The RSM will present a report-back from the First National Conference for Students and Youth Activists, that took place in Toronto last December with the hope of rallying new forces to the cause! This entry was posted in Uncategorized and tagged anti-capitalism, investigation on the activities and politics of the far left, quebec, student. Bookmark the permalink.